A real estate development and investment company with three luxury student housing properties near the University of Colorado campus plans to redevelop a fraternity house on University Hill starting this summer. The approximately $12 million redevelopment of the SAE house at 1101 University Ave. is the latest of approximately $39 million worth of urban infill projects Brickstone Partners has undertaken in Boulder. “You have a unique mix in Boulder of development constraints, barriers to entry, and the demographics of the student population can support luxury student living,” said Brickstone principal Daniel Otis. 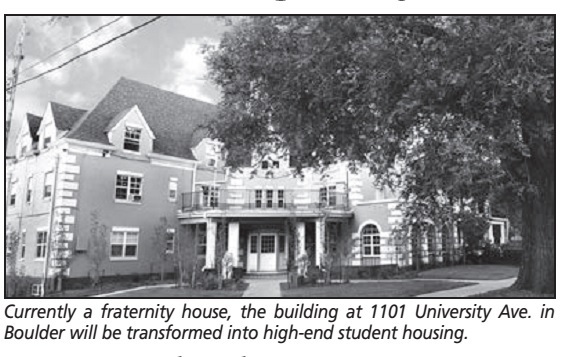 Otis acquired 1101 University, a longtime sorority house that was built in 1924, in partnership with Mike Fancher, CEO of Iconic Investments in Denver, 3½ years ago. Fancher and his father, Geroge Fancher, also invested with Otis in three other Boulder developments: 910 28th St., 1005 12th St. and The Lux at 955 Broadway. “It’s a beautiful old building,” Otis said of the property at 1101 University. “When we bought it, it was boarded up. The city had deemed it uninhabitable.” Brickstone Partners renovated the property and leased it to SAE, which plans to vacate the building in July. The four-story, 25,000-square-foot building will be transformed into a 54-bed high-end student housing property for occupancy in fall 2013. “It’s hard to find well-located infill redevelopment opportunities in Boulder,” said Otis. “The location is a special location, being right on the Hill in Boulder.” The building will retain its historic charm. “We want to be true to the nature of the historic structure. It’s such a beautiful building. We don’t want to change that,” said Otis. Shears Adkins and Jeff Dawson of Boulder are the architects. The property will feature a mix of two-, three- and four-bedroom units. As with Brickstone’s other Boulder projects, units will share kitchen and living areas, and each bedroom will have its own bathroom. Unit sizes and rents haven’t been finalized, but units within the company’s other Boulder properties are large, with rents ranging from about $850 to $1,400 per bed. They include: 855 Broadway, a redevelopment of a former fraternity house that was completed at the end of last year; 910 28th St., a 60-bed ground-up construction project with underground parking that is slated for completion in mid July; and 1005 12th St., a redevelopment by Boulder’s Peter Stainton and Kyle McDaniel that Brickstone acquired and updated a year ago. The high-profile building at 855 Broadway is known as The Lux. “It was kind of a fun property because it was such an eyesore before,” said Otis. The Lux was fully leased this spring and is 60 percent to 70 percent preleased for next fall. Floor plans range from two bedrooms with approximately 1,200 sf to four bedroom units with 1,800 sf. The 910 28th St. property, designed by Shears Adkins and being constructed by Confluence Builders, will offer underground parking and predominantly three-bedroom units, with some two- and four bedroom units that range from 1,200 to 1,800 sf. It will feature a distinctive “green wall” and covered outdoor space on the top level. From 2005 to 2009, Brickstone was the local operating partner of Minneapolis-based Chesapeake Cos. During that time Chesapeake sold 999 17th St. in downtown Denver to Shea Properties and developed numerous build-to-suits across the country for Jared Jewelers, Darden Restaurants, Buffalo Wild Wings and others. Brickstone Partners is based in Denver with an office in New York.